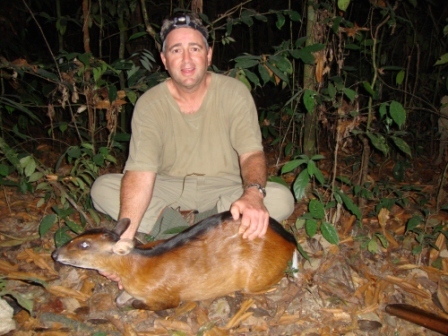 Ken Wilson hunted the Bella Forest in December with Morris Dougba's Liberia Rainforest Safari (as reported in our December 2013 Newsletter). Based on his success, 11 hunters (so far) have booked for 2015. Now what about this year? Rex Baker and Dennis Campbell had to postpone their safaris, but Craig Phillips and John Colglazier were able to hunt for 7 days in March. This is what they had to say. Per Craig: "The short version is that the trip was tough, but interesting. The country is beautiful. The forest, relative to others I have seen, was fairly mild in terms of vines, bugs, thorns, poisonous plants, etc. While forest hunting is never easy, this was better than expected." Note from Shunneson & Wilson: There are currently only 37 entries of Black Duikers in the SCI On-line Record Book, which is the most up-to-date hunting source. Of those, 33 were taken in Liberia. Per Craig: "I think everyone on the ground agreed we could have used some rain and the verdict was the crunchy leaves ran many of the critters off. Your staff, to a man, was excellent, friendly, and hard-working. Also, the people of Liberia are super friendly." Note from Shunneson & Wilson: The historic average rainfall in Liberia in March has been 3.82 inches, so Craig and John were unlucky in that no rain fell just prior to their arrival or during their stay. Per Craig: "I told Morris when I had time I would send him a list of constructive suggestions which I think are easily do-able. Most are around creature comforts and the food (which I thought was pitiful)." Note from Shunneson & Wilson: Ken Wilson agrees with this assessment. 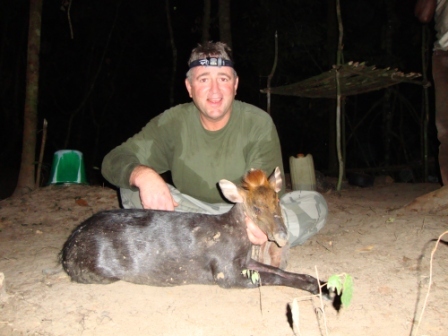 Franz Coupe is currently in Liberia to assess and improve both the hunting and the comforts/food. Per John: "It's a very special adventure. We weren't overly successful, but the forest was extraordinarily dry....That was the fifth rain forest I've hunted, and it was by far the best. I look forward to returning." 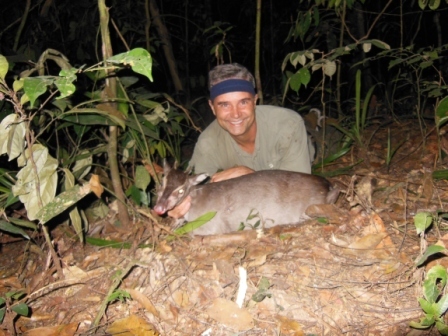 Note from Shunneson & Wilson: There are currently only 48 entries for Maxwell Duiker in the SCI On-line Record Book (as compared to 532 for Blue Duiker). John shot two. The one pictured above should be a Top 10 animal when officially scored. Famous Congo-Cameroon-C.A.R. 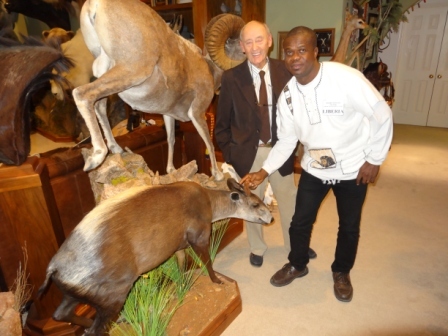 professional hunter Franz Coupe (pictured above with Morris Dougba in Wilson Stout's trophy room during the 2014 Dallas Convention) is currently in Liberia to assess and improve the hunting, roads, trails, camps, food, etc. So far he reports an excellent Duiker population and also excellent numbers of Dwarf Forest Buffalo and Red River Hog, so that the chance of success for each of those should be high. He is now moving to the "Bongo and Giant Forest Hog area." So far in that area, he has discovered that the animal that the locals call "Giant Bushbuck" is really a Forest Sitatunga!! 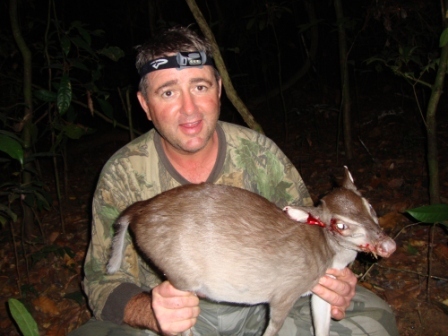 Franz will entertain one hunter before the end of the season this month, and he is Weatherby Award Winner Ed Yates. We will have a full report next month.